The motorist was squeezing his way through the vehicles when he hit the woman while she was crossing the road when the traffic had stopped at the traffic light. The motorist escaped with no injuries while the woman was rushed to the Peebles hospital by persons on the scene before police and the ambulance arrived. 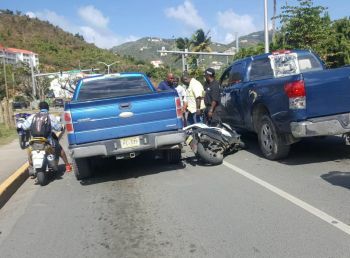 Meanwhile, there was also another scooter accident, today on Jost van Dyke and the rider was injured and had to be rushed to the Peebles Hospital on Tortola. 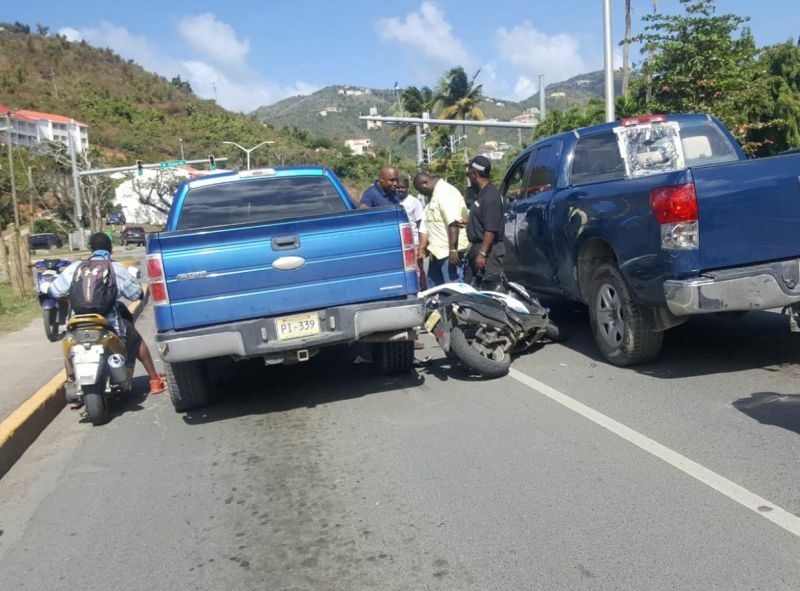 Scooter accidents have become a frequent occurrence over the past 6 years in the Virgin Islands (VI) and have caused death, injuries to riders and resulted in thousands of dollars in damages to automobiles. One clergy had called for the banning of scooters, however, it was an unpopular idea. And in the photo some idiot with no helmet on passing behind the blue truck.